LUCKNOW, India - June 17, 2018 - PRLog -- The 6th Mango Festival organized by the Awadh Growers Association led by Jyotsna Kaur Habibullah in collaboration with UP Horticulture, NABARD, supported by brands like Maaza, Gyan, Rare Rabbit and more sparked off with a visit to Abbasi Orchard in Kakori on June 17th. The festival was initiated 6 years ago to support small and marginal farmers, creating eco tourism, boost agribusiness and brand building exercise for UP's Mangoes. We support and promote local businesses and small farmers and producers, aiming to establish Lucknow as the Mango Capital of the World. The owner of the Orchard, Mr.Shahid Abbasi says, "This orchard is more than 100 years old and I am passionate about orchards as its been my family business for over 200 years and its the need of the hour to restore this business and maintain plants and save them from cutting and creating a concrete jungle." The GM of Gyan mango products Vijay Upadhyay launching their Mango Lassi this season said - "Mango pulp was hard to find in UP which is why this lassi had pulp from Maharashtra. But I am delighted to meet the Horticulture team and progressive farmers here and am sure we will have Mangoes from this belt in our products soon". The orchard looked very festive with handmade decorations of butterflies, birds and sunflowers made from recycled cloth and paper by village artisans. A large number of visitors flocked to the Orchard to create memorable moments with their near and dear ones. Eminent eye surgeon Dr. Sanjeev Hansraj cycled from Lucknow to Abbasi orchard Kakori to spread the message to promote a clean environment. Actor Asheesh Kapur, Tourists from the US Spencer, Maggie and Amisha were delighted with the visit and other distinguished guests also visited the orchard. Jeweller and poet, Lata Kadambari and her family who drove from Kanpur enjoyed the Mangoes with great gusto, eating fresh Mangoes in the orchard was a memorable experience, they exclaimed. Satyajit Puniani and his family who drove from Delhi for the festival enjoyed the entire experience and were especially impressed with the eco friendly décor, crockery and cutlery. DGM Nabard Mr Shankar Narain and his team participated enthusiastically in the orchard tour and committed to take this forward and promote more orchards. Director Horticulture Raghuvendra Singh was very appreciative about the event and said that the department looks forward to more such progressive farmers taking Mangoes to the world stage. More than 300 families and people from other cities like Kanpur . Allahabad and even from Delhi enjoyed the ambience of the orchard, foreigners visiting Lucknow were also seen soaking in the atmosphere of the festival. Jyotsna Kaur Habibullah, founder of the festival said, "I am delighted at the growth of the festival and to see the enthusiastic participation of so many people from different parts of the country and even abroad. This fabulous event has been made possible because of the amazing team that has worked with me over the last 2-3 months. Look forward to growing the festival to more locations each year and promoting UP's famed mangoes to ensure the orchards don't get converted to commercial land." The events included, sack, spoon and other races, tonga and bullock cart rides, horse riding, Orchard walks, story telling, and tractor rides. Mango eating was enjoyed with great gusto. Winners awarded by Gyan, Maaza, Cherry tree, Sweet Nothings, Frames and Filters etc. The dappled shade of the mango trees, cool fresh breeze, mesmerising songs of the birds, ripe and delicious mangoes hanging off the branches, made it a memorable outing. The delectable freshly cooked kakori kababs and hot tandoori & missi rotis were the perfect end to the orchard visit. The food was served in ecofriendly recyclable plates, cutlery and glasses. Awadh Growers Association is an organisation formed for the promotion of Mangoes and for the benefit of Farmers in Uttar Pradesh. We started Uttar Pradesh Mango Festival and have been organising the festival annually every June since 2013. 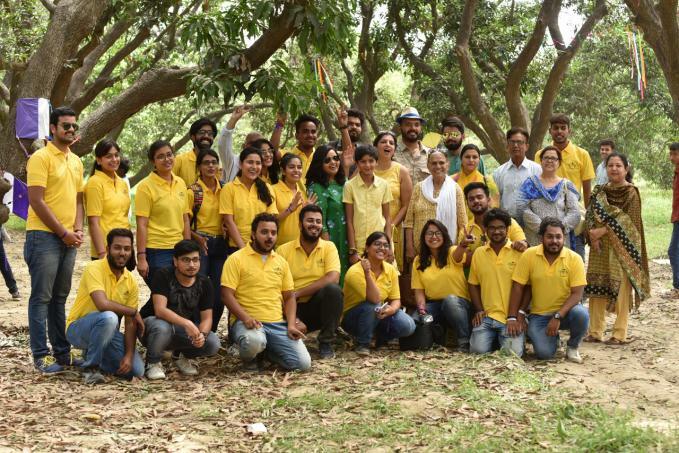 In 2016 Uttar Pradesh Mango Festival was put on the Calendar for Uttar Pradesh Tourism and Awadh Growers Association and the founder Jyotsna Kaur Habibullah are a member of the organizing committee. This festival has been organised in collaboration with the Uttar Pradesh Government with the Tourism and Horticultural Departments and spearheaded by Jyotsna Kaur Habibullah founder of Awadh Growers Associated from Habibullah Estate Orchards with Madhvendra Deo Singh and Shahid Iqbal Abbasi this year's convenor of the orchard visit.